Public Meeting: Democracy Needs You! 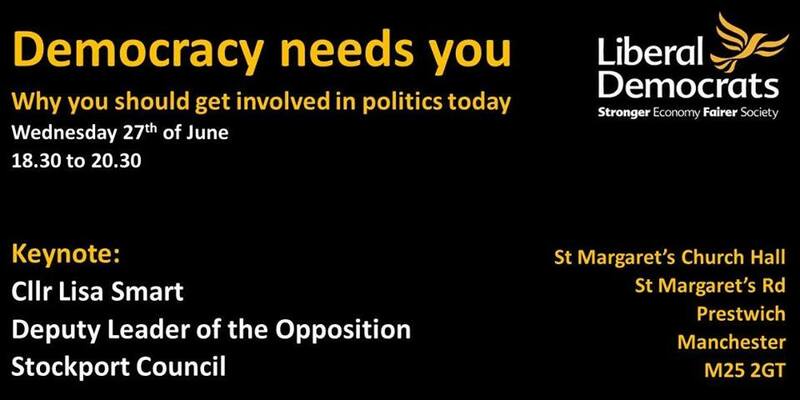 Bury Liberal Democrats have organised a public meeting on the theme: “Democracy needs you: why you should get involved in politics today”. “Democracy is threatened whenever we take it for granted” former USA President Barack Obama says. We will look at how democracy works, why sometimes it doesn’t and how you can be part of fixing it. Remember – decisions are made by those who show up! Wednesday 27 June, 18-30 -20.30, St Margaret’s Church Hall, St Margaret’s Road, Prestwich. Our speaker is Councillor Lisa Smart, Deputy Leader of the Opposition on Stockport Council, and the Liberal Democrat Target Parliamentary Candidate for Hazel Grove constituency. The event is free and open to the public. We ask everyone to register for a free ‘ticket’ in advance so that we can manage number. In 2016 a referendum was given to the UK. This was whether we (UK) wanted to remain in the EU, or whether we wanted to leave the EU. Of the people that voted,17.4 million people voted to leave(17.4 million being the majority of voters).If you intend to hold a meeting about DEMOCRACY, why does your party, and others, choose to go against the vote.Is it because the vote didn’t go your way , or is there another motive? please reply.